Since her jaw-dropping high school debut, there's been no stopping Moforehan Abinusawa. 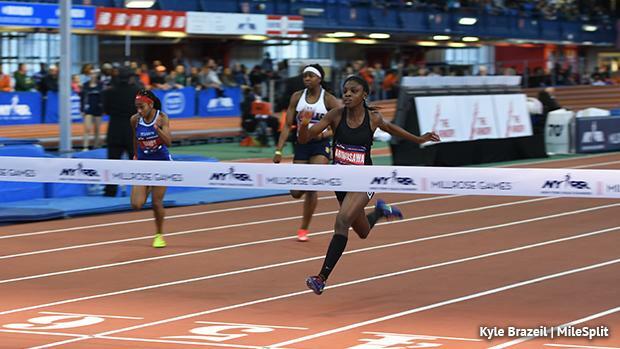 The Germantown Academy freshman, who was tearing up the middle school and AAU scene before her enrollment in high school, kept her tremendous ninth grade season rolling with a signature win at the Millrose Games. Abinusawa went 7.33 to run away with the Junior Girls 60 meter dash victory on Saturday at the Armory. It past years, the Junior Girls competed in the 55 meters, but this year the race was lengthened to a full 60 meters. Thus, it makes Abinusawa a Millrose games record holder. Not only was it Abinusawa's most high profile win to this point in her career, but it was also a record-setting performance in more than one way. Let's take a closer at the numbers behind her 7.33. Abinusawa tied the Pennsylvania state record in the 60 meter dash, matching Thelma Davies' 7.33 from New Balance Nationals Indoor last year, a time that Davies bettered or tied each year of her high school career since her breakthrough freshman campaign. Abinusawa matched the state record in just her fourth time racing the event in a final at the high school level. Davies ran in the pro women's 60 meter field, clocking a 7.45 for seventh place. She was the two-time defending champion in the girls 55 meters and moved up to the professional field this season. It's the third straight year that a PA girl has won the event at Millrose. If Abinusawa was a few years younger, she would have held the freshman class record. But Tamari Davis of Florida emerged on the scene last season and rewrote the freshman record books in the sprints, both indoors and outdoors. At New Balance Nationals Indoor, Davis won the national title and set a new freshman class record, running 7.25 in the finals. Davis ran 7.30 midseason in early February last year at the Dunamis Super Meet. Abinusawa's trajectory isn't far off Davis' from a year ago. Abinusawa's 7.33 ranks her No. 21 all-time by United States high schoolers, per the MileSplit database. It would be a good bet to assume Abinusawa isn't done moving up the all-time list. Abinusawa currently sits at No. 2 in the nation this season. Only the aforementioned Davis ranks ahead of her. Davis is the defending indoor national champion and Davies placed second in that race. Abinusawa has proven this season that she belongs in the conversation with those two stars. With Davies racing in the women's 60 meter dash on Saturday at Millrose, the long-awaited showdown between the state's top sprinters will have to wait even longer. At this point, the PTFCA Indoor State Championships will be the first head-to-head showdown between the two stars. It won't be a race to miss.